L. Forrer, Biographical Dictionary of Medallists, London, 1904, vol. I, p. 186. Natalis Rondot, “Nicolas Bidau: Sculpteur et médailleur à Lyon,” Revue du Lyonnais, 4, 1887, pp. 237-255. Nicolas Bidau trained as a medalist in Lyon with Claude Warin (c. 1612-1654), whom he succeeded as portraitist of the city’s provost of merchants and magistrates. Bidau modeled this portrait of François de Baglion, comte de La Salle, in 1658, during Baglion’s two-year tenure as provost of the merchants of Lyon. 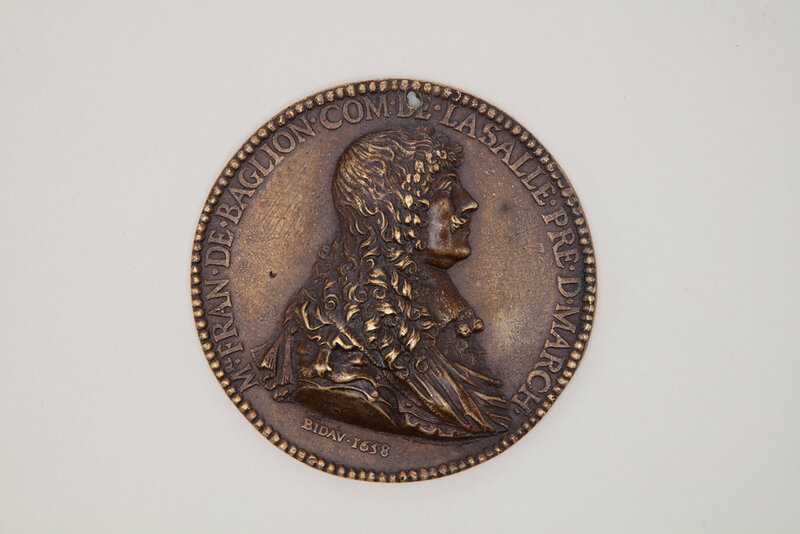 It is one of the artist’s best-known portrait medals, of which about twenty are known. Bidau was also an accomplished sculptor on a large scale and executed numerous works in Lyon, including a statue of the Virgin for the façade of the church of the Jacobins, the stucco decorations for the church of Saint-Pierre, and a Pietà and the tomb of Nicolas de Neufville, first duke of Villeroy, for the convent of the Carmelites. Bidau was named sculptor to the king in 1680.